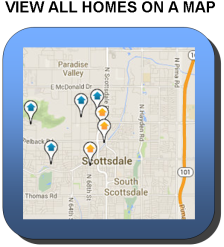 From this page you can easily access all Scottsdale homes for sale with city light views. 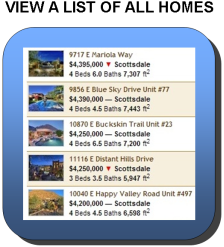 Our real estate listings are updated daily from the Arizona MLS and include full property details such as address, photos, virtual tours and more. To begin, simply click on one of the buttons below to view all homes on a list, or by location on a map. While not exactly rare, roughly 23% of all homes listed for sale in Scottsdale, through the MLS, have at least partial city light views. As you might have guessed, homes on these lots are in demand, and generally command premium pricing depending on the level of views. These properties typically do have mountain views as well. In our experience, the best city light views in Scottsdale are in the communities of Scottsdale Mountain, McDowell Mountain Ranch, Ancala, Country Club side of DC Ranch, and the south side of Stonegate and Scottsdale Ranch, bordering the Indian Reservation.